May 22, 1987 was a Friday. The top story in that morning’s paper reported massive weapons searches by the Detroit Police in Detroit’s public schools may be illegal. Even the chief of operations for the Wayne County Prosecutor’s Office questioned the legality of the heavy-handed police tactic. I Knew You Were Waiting for Me by Detroit’s own Aretha Franklin was one of the top tunes on the radio. As it turns out, the police were waiting for Richard Wershe, Jr.
Wershe had been recruited at age 14 by the FBI to become a paid informant against the Curry Brothers, a drug gang connected by marriage to Coleman Young, Detroit’s all-powerful mayor. Wershe dropped out of school to play junior G-man full time. Not only did Wershe inform on the Curry gang, he told the FBI about corrupt Detroit cops, too. Wershe’s undercover work was for a federal and local drug task force. There were Detroit cops assigned to the task force. It is reasonable to believe word got back to the Detroit Police narcotics section that Wershe was telling on cops on the take. When a federal drug task force got what it needed from Wershe’s dangerous undercover work they kicked him to the curb to fend for himself. The teen informant turned to the only trade he knew; the one law enforcement taught him. He decided to become a cocaine wholesaler. In the spring of 1987 Rick Wershe, Jr. was on the police radar as a rising newcomer in Detroit’s drug underworld. By then the teenager’s social network mostly revolved around ruthless men in Detroit’s black drug trade, men for whom murder was just a cost of doing business. Wershe had no family support network to speak of. As he told the Michigan Parole Board in 2003: “I really didn’t have any parental supervision at the time. I was basically raising myself and I went down some wrong paths.” Richard J. Wershe, Jr. was 17 on that fateful night in May, 1987. The weather was nice. It had been in the mid-80s during the day. As night fell the skies were mostly cloudy, as usual for Detroit. About 8:00 p.m. that Friday night, Rick Wershe was a passenger in a car driven by his pal, Roy Grissom. They pulled up to Wershe’s family home on Hampshire on Detroit’s east side. A Detroit police patrol car was waiting for them. The police put on their lights and made a traffic stop. One of the cops was Rodney Grandison, an officer Wershe knew well. Wershe says he and Officer Grandison smoked pot together from time to time. The flashing police lights quickly attracted neighborhood attention. As the police approached the car, Wershe tried to stash a shopping bag of cash under the front seat. The officers saw him do it and they tried to grab the bag of cash. But somehow Wershe’s sister Dawn, who, along with Richard Wershe, Sr., had run out of the house to see the commotion, managed to get the cash first. She ran back in the Wershe family home with the cash bag. Other police cars waiting nearby quickly swarmed onto the narrow residential street, clogging it along with numerous residents who had come outside to see what was happening. The commotion and confusion escalated. In the chaos Rick Wershe slipped away—empty handed. None of the police officers stopped him. Months later at his trial, Wershe remembers the police testified that a crowd quickly materialized and in the re-telling they said people were circling the block in Jeeps firing pistols in the air. Why, I asked, with so many police at the scene didn’t any of them arrest the people shooting guns? “It (the trial testimony) sounded like a movie, dude,” Wershe told me as he tried to describe the farcical nature of his jury trial. He also notes any streetwise young man knew not to carry a weapon in a Jeep because most police officers equated a Jeep in the ghetto with a drug dealer so traffic stops of Jeeps were commonplace. What happened next depends on who is doing the talking—or testifying. A young woman who was Rick Wershe’s age named Patricia Story lived one block over on Camden. 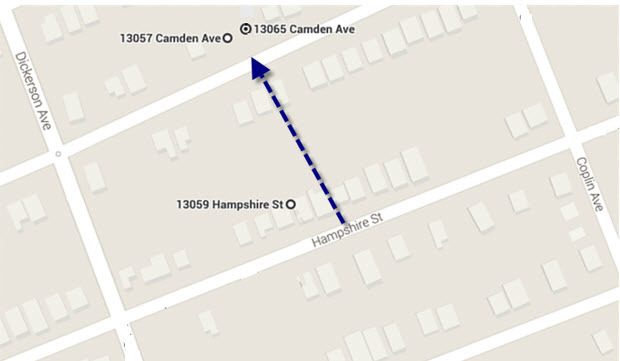 At Wershe’s preliminary exam she testified she saw him walking between the houses between Hampshire and Camden carrying a box. She testified she was sitting on the front porch and Wershe approached her. Q: “And what do you say to that? Ms. Story testified Wershe proceeded to her back yard, anyway. She went in the house for a few minutes and didn’t see what he did with the box. She said the next time she saw Wershe he was across the street walking with a police officer between the houses toward his home on Hampshire. He didn’t have the box. Patricia Story’s testimony sounds straightforward enough but there’s more to know about her. More on that later. Story’s next door neighbor, David Golly, testified he was sitting on his front porch, next door to the Story home at the same time that Patricia Story was sitting on her porch. Golly testified under questioning by the case prosecutor that Rick Wershe walked to his porch from the Story front porch after he spoke briefly with Patricia Story. Q: “When he comes up to your porch, when he comes toward your porch, does he say anything to you? Notice Golly contradicts his next door neighbor. Patricia Story testified Wershe had a box in his hands. Golly testified he didn’t. The only thing they agree on is Wershe’s apparent interest in the back yard. There’s more to know about Golly, too. More on that later. Golly testified he went to the Story back yard with Patricia Story’s father. Together they started looking for a box. Golly says he found it beneath a porch. He told the court Mr. Story panicked and ran back in his house. Q: “After you saw the box under the porch, did you see anybody open that box? Hmm. The box is sealed shut, according to Golly’s sworn testimony. Several hours later the police show up at the Story house after a telephoned “anonymous tip.” A police officer takes the box. That officer was the third and final witness at Wershe’s preliminary exam; Detroit Police Officer Greg Woods, a member of the self-styled No Crack Crew of local and federal narcs. The No Crack Crew had been after Rick Wershe for several months. Woods testified he arrived at the Story house about 10:00 p.m. that night. He said as he arrived the owner of the house was coming out of the house and toward the police officers with a box in his hands. Under prosecution examination Woods says he took possession of the box from Mr. Story. Q: “When you take possession of the box, do you eventually open it or are you present when it is eventually opened? Officer Woods testified when he opened the box he saw what he knew to be wrapped kilos of cocaine. He said there were eight kilos in the box. Rick Wershe and a pal are stopped by the police on a pretext traffic stop. A crowd spills into the street along with dozens of cops. There are questions which remain unresolved to this day. If Wershe didn’t have box with him when the police made the traffic stop, where did it come from? Was anything removed from the box? Did Wershe have a box or not? This installment of Informant America has just scratched the surface. The mysteries and conflicts surrounding the evidence and testimony used to send Rick Wershe, Jr. to prison for life go even deeper and raise more disturbing questions. More on that next week.